Camping with friends or your loved ones will be more rewarding with the best RV inverter. This device works by converting DC to AC power without any hassles. It can supply continuous power out and peak surge up to certain wattage with rating depending from one model to another. But with plenty of choices around, you might find it confusing than helpful to select the right one for your requirements and specifications. For this reason, we have created a guide that outlines the things to look for as well as top-rated products in the category to begin the selection process and later help you decide which to buy for your recreational vehicle or travel trailer. Also in this guide, we’re answering the most common questions related to its installation and use. Let’s begin. 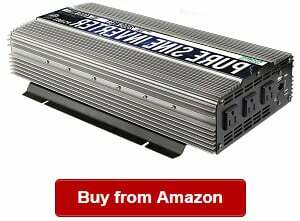 When shopping around for the best 3000 watt pure sine wave inverter, you should not miss the Power TechON on your list of a 3000W pure sine wave inverter for the RV. 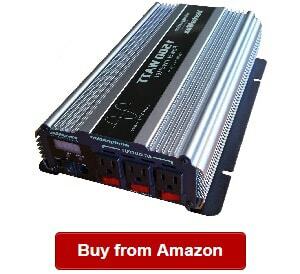 If you’d select it, you can have peace of mind that you can use a pure sine wave inverter for your vehicle. The device is also ideal for its versatility because it can be used for different applications, such as in cars, boats, camping and PC. 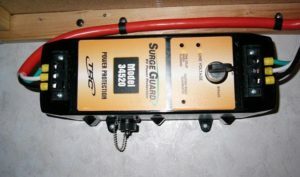 You can rely on the device in the event of a power failure, a reason it is chosen by many RV owners for their vehicles. The Power TechOn is also reliable because it can convert direct current power into to alternating current without any hassles. The inverter has the power to deliver up to 6000W of surge power or a continuous 3000W outlet. One more I would like to note is that this portable inverter comes with five modes of protection systems, making it a great investment that you can always rely on all the time. Namely, these are over voltage, under voltage, low voltage, overload and thermal protection. It is also a smart inverter that offers low harmonic distortion, promoting a top efficiency level when you need to power different RV appliances. 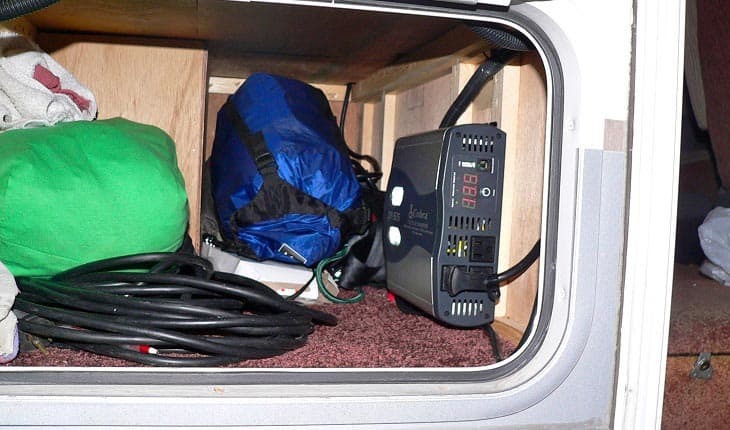 Another thing I find remarkable about the power inverter is that it is solid and compact, one quality that makes it adaptable in tight RV spaces. The device is also convenient to use because it can work well for 12V DC to 120V AC. I also liked its LED light, immediately informing users of any issues. The device is also made durable for its two cooling fans that prevent overheating. Other things I liked include its USB port, black and red starter cable and wire remote. On a negative note, the product has a bulky remote control, though. With all the smart and efficient functions of the unit, this issue is minor to consider. The AIMS Power is one of the most reliable brands on the market regarding power inverters for the recreational vehicle because it is versatile, allowing users to use it for different applications in boats, campers, travel trailers and recreational vehicles. Just as what you can probably read from Aims inverter charger reviews, the brand is offering quality and heavy-duty power inverters. This model, in particular, is a favorite among travel trailer owners. For one, it is affordable yet it is built to last. The device is also able to deliver up to 3000 watts of continuous power draw. Also, it is one of the highest in terms of power surge capability of up to 9000 watts versus other models and brands do. This power inverter can also prevent overheating damage for its thermal fuses and cooling fan. It is also built with a durable aluminum case, which makes it sturdy to stand up against harsh conditions. The device can also offer both overload and overheating protection. These two features add to the durability of the device that you can depend on for long-lasting use. I also liked that the inverter won’t suffer from overheating, protecting your valuable investment from damage. Regarding quality, you can rest assured that this device is a top one because it is UL certified for safety and quality. The power inverter for the RV is also efficient in terms of value for power backup systems. For one, this unit can help in minimizing energy loss. You can turn on the save mode or its 25-watt hibernation. On the negative side, it is expensive. The Ampeak is another product not to miss on this list because it is a promising new product that has what it takes to compete to the rest on the list. It is a reliable inverter that works well in converting DC to AC power when needed. The Ampeak 2000-watt Power Inverter is powerful when it comes to delivering continuous output power of 2000 watts along with surge capacity of up to 4000 watts. You can rely on this unit when it comes to powering all the devices inside your vehicle. This product also includes three pieces of AC outlets along with a USB port, ensuring you can connect multiple devices at once. In addition, you can be certain that you can make use of the power inverter anywhere you need it. You will also appreciate its shutdown protection. It works automatically in the event of short circuit, overheating, over voltage or low voltage. It ensures the protection of your RV appliances and devices every time you’re using it. Another thing I liked about the inverter is its impressive feature of having a smart digital display. You can be certain that it will show you necessary details, including fault codes, AC output wattage and DC input voltage. In addition, you can be certain of safety because this product is able to offer multiple protection systems for its audible alarm. When it comes to durability, you will appreciate its ABS case, which can promote the unit’s stability as well as electrical insulation. These great features make the unit a top choice among recreational vehicle owners. On the negative side, it has lower continuous output power than others on the market do. 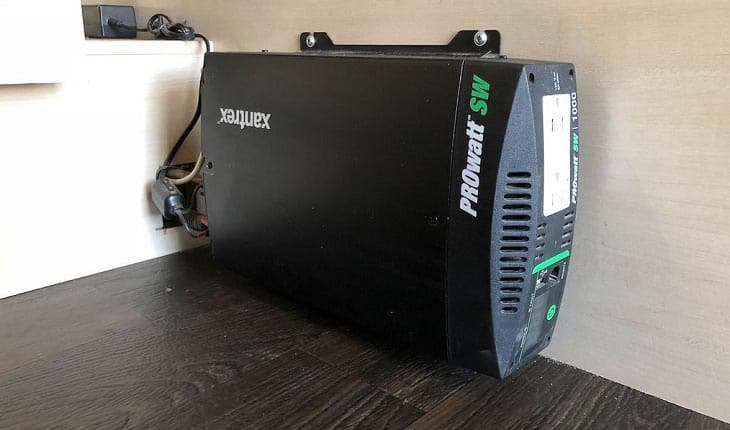 In terms of best pure sine wave inverter for RV, one of the best choices around is the VertaMax RV power inverter for its ability of delivering up to 1500 watts of continuous power and power surge capability of up to 3000 watts, giving users the ability of powering different appliances at the same time without any problems. This kit is also complete with all the things you need for quick setup, including two gauge battery cables, each at three feet, cable lug terminals, 150AMP ANL fuse, remote switch, ANL fuse holder. That said you could easily install this on your vehicle in minutes. I also liked the smart design of the product. You will not have a hard time using it because you can find all its functions, including reverse polarity protection, thermal shutdown, overvoltage protection, short circuit protection, high and low voltage alarm and low voltage shutdown, in one place. So no matter the potential issue that would damage your appliances and the device, you can see it quickly on the intuitive design. I would also like to recommend the power inverter because it is complete. In fact, the design has included three grounded AC outlets intended for 115 AC household devices in the US. Plus, each of the outlets also comes with its circuit breaker. It can also efficiently continuously monitor power usage for its LED display that shows DC watts and battery voltage or AC power consumption. The unit is also versatile enough to power major and minor appliances, including televisions, computers, microwave ovens, air conditioners and cellular phone chargers. On the negative note, the product comes with a short warranty that can be improved. 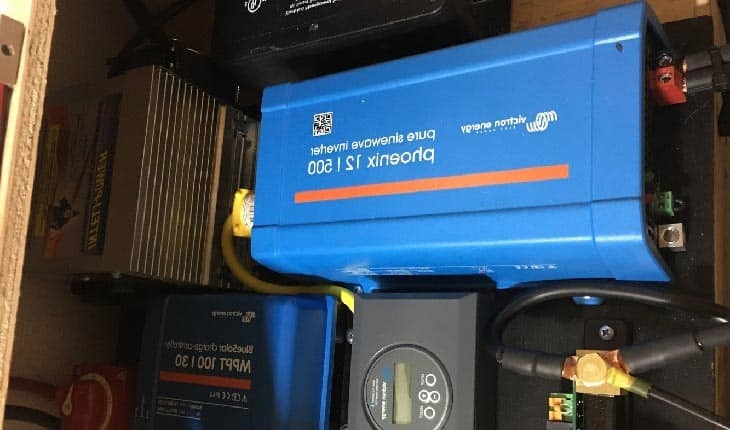 But with all the great things that come with the inverter, this minor issue is outweighed by the benefits of having the device. 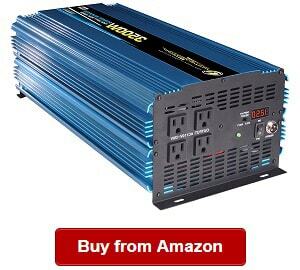 In this review, one of the top choices not to forget when looking for a recreational vehicle inverter is the POTEK best 2000 watt power inverter. It is reliable device chosen by RV owners because of its performance. For one, the unit can help in providing up to 2000 watts of continuous DC to AC power. Also, it can offer up to 4000 watts of peak power, one of the most powerful around. I also liked the Potek 2000W because it is designed with three outlets for added convenience and ease of operation. You will also appreciate that it comes with a charging port for different electronics charging. It can be used in powering your appliances, including refrigerator, microwave and other appliances, while giving you peace of mind for its protection systems. Using this unit, you can be certain that your RV appliances will be protected from under voltage, over current, over voltage, short circuit protection, overheating and overload. To protect from overheating, the device has a built-in cooling fan. I liked that it will start working when the temperature reaches more than 104 degrees Fahrenheit. And when using it, you can rest assured of safety because it comes with eight internal fuses. I also find it reliable for this function especially when used in remote job sites, camping grounds and on the road. You can also use it in places where you need AC power. It is also a complete kit that comes with all the things you need to use it immediately, including a user manual, four pieces of battery cables, one power inverter and two-year warranty. On a negative, it is quite bulky. If you’re looking for a 2000W power inverter, you might want to take a look at the Xantrex model 806-1220. It is a decent choice, which is also top rated in the category for its advantages. For one, it has a good digital display for showing output power and DC volts power. It is important when looking for a power inverter so that you can easily check what you need to see to avoid any potential issues. You can also rely on this one for its top quality. In fact, it meets the strict quality standards of UL458, ensuring your peace of mind that you’re buying a quality and safe product in the category. You can also take advantage of the USB port that comes with the unit, allowing you to charge different electronics, including tablets and cellular phones. The device is also smart with multiple protection modes for low voltage and over voltage. It will shut down automatically with low voltage of 10.5 V DC and has a low voltage alarm at 11 V DC. The device also has an over voltage protection when power reaches at 15.5 V DC. For safe operation, this product also comes with dual GFCI AC receptacles. You can also have peace of mind for a trouble-free battery connection for its heavy-duty terminals. The device also comes with an ignition lockout for its available on/off remote switch. Overall, this inverter is a top choice that you can rely on if you’re looking for a heavy-duty and reliable power inverter for your service vehicle. It comes with solid and dependable features that make it a top contender among RV power inverters. 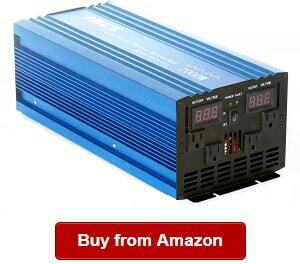 It is a compact and easy to use power inverter that is ideal for marine applications, commercial trucks and recreational vehicles. 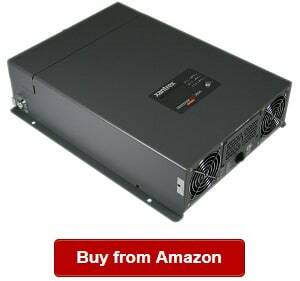 You can depend on it if you’re looking for a good power inverter that can supply power for various electrical loads, such as advanced electrical appliances, variable speed power tools and so many more. On a negative note, it has a not so bright display. The Power Bright PW3500-12 is another power inverter not to forget on the list because it is top performing and can efficiently provide power to major and minor RV appliances. 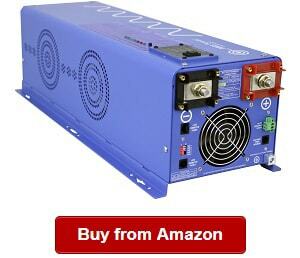 This product can provide up to 3500 watts of continuous DC power. I also find it one of the most powerful in the category because it does not only perform well but it is also made of heavy-duty components. 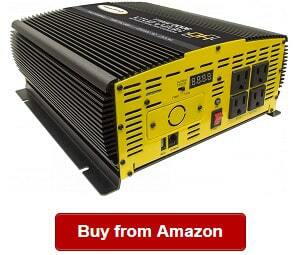 The 3,500-watt Power Inverter is a reliable and compact sine wave power inverter that you can count on. In fact, you can also plug it directly to your 12V DC batteries, making it a versatile product for use in different applications. The 3500=Watt power inverter performs efficiently once you’ve plugged it in directly, powering your devices and electronics, including gaming consoles, laptops and power tools. You can also rely on it for supplying power to other RV appliances, including coffee makers and televisions. The unit is also reliable for being able to supply up to 7000 watts of peak power. This rating is quite high for use in your household appliances. Another thing I liked about it is that it is made of solid and durable anodized aluminum construction, which is a heavy-duty component to last through the years. Aluminum is also known for its excellent ability in dissipating heat, preventing too much heat accumulation in the unit. And you also don’t have to worry about short circuit because this device can automatically shut down during a short circuit. It is one of the most useful features of the device that ensures it is protected from damage. The Power Bright PW3500-12 is also convenient to use for its bright LED display, which is able to show the input and output voltage clearly. With it, you can easily monitor what you have to see all the time without any hassles. It is also an intelligent model that has low voltage alarm that you need to know. This alarm will give off a sound in the event of a short circuit, thermal or overload issue. These features add to the reliability of the device. You can also rely on its cooling fan that can prevent the damage due to overheating. When it comes to RV inverter installation, you can also find this one easy to install. On a drawback, it is heavier than other models are. It also comes with a shorter warranty that can be improved. 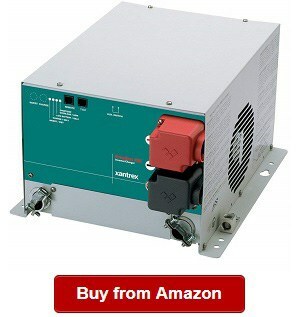 If you’re looking for backup power supply for appliances, such as blender, vacuums, chainsaws, power tools and refrigerators, you might want to take a second look at the 3000W model power inverter from KRIËGER, a world-renowned brand for its commitment to quality and performance in the power inverter industry. This model is able to supply up to 3000W of continuous power along with 6000W of peak power. It also works efficiently when it comes to converting 12V DC to AC power whenever you need it. Another thing to appreciate about this product is that you can connect it directly to power your battery, supplying you with mobile power you can depend on. It is also a complete kit that includes three feet battery cables, ANL fuse kit and wired remote control. All that you need for quick and easy installation are included in the set. 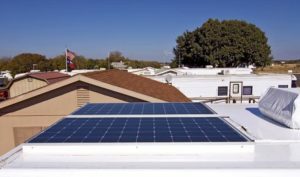 So when it comes to installation, you don’t also have to worry about ways on how to install inverter charger in RV because this one is a breeze to set up. The KRIËGER 3000 Watt 12V Power Inverter is also reliable for its top performance and multiple protection systems provided. The unit can protect your RV from short circuit, thermal damage and overloading. You can easily check on these things on the LCD display. The screen will also show you output voltage, input voltage and battery level clearly. All the details you need are easily found on the display. It is also a high quality unit that meets quality standards of authorities. It has been tested and approved by METLAB, ensuring its performance and safety. The product is also approved by MET under CSA STD C22.2 and UL STD 458. Another thing I liked about KRIËGER 3000 Watt 12V Power Inverter is its long warranty of thee years on labor and parts; it is something that others do not offer. Other inclusions in the model include an inline fuse and a user manual. On a negative note, the model is a bit pricey. Camping is rewarding especially if all the conveniences you get from home are also available onboard. One of those is the ability of using appliances, such as televisions and blenders. Whenever you need backup power systems to convert DC to AC power, you can have peace of mind if you have the AIMS Power 5000 Watt DC To AC Power Inverter with you. The powerful inverter is able to supply up to 5000 watts of maximum continuous power along with up to 10000W of surge peak power. It is one of the highest rated among the products included in today’s reviews. The AIMS Power is also one of the best around when it comes to providing multiple protection systems against overheating, for example. 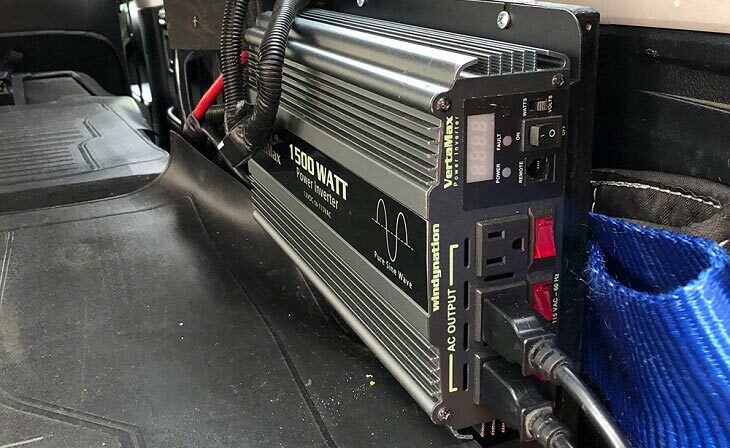 The best power inverter for RV, however, does not have to be bulky. This one only measures 17 inches long, giving a smaller footprint ideal for tight RV space. It is the smaller version of the AIMS 5000W, which was also top selling. The power inverter is the upgraded version that is also better than its predecessor was. It is ideal for toy hauler and even large recreational vehicles, too. The model is also included with an AC direct connect terminal block for use for applications requiring 5000 watts. The solid and top performing RV power inverter can also provide up to 41 AC Amps, making it ideal for use in tools, pumps, compressors and motors. This product is versatile that it can be used for boats, homes, solar, cabins and vehicle outfitters. This AIMS Power also includes a voltmeter to find on the front panel, easily monitoring battery voltage level. It also includes an amp meter, which is able to inform you of current consumption. Another thing I liked about the unit is its quadruple AC receptacle that you can rely on. In addition to all these, the unit also comes with a thermal cooling fan to prevent its overheating. Also, the product is also fuse-protected internally. And for proper heat dissipation, this model is designed and built with an aluminum case. On a negative note, this product is a bit heavier than other models on the market are. When trying to buy a reliable RV power inverter, you should not miss the Xantrex Technology Inc, 81-2010-12 on your list. It is another impressive inverter that works well in powering your appliances without any hassles. The model is a powerful unit when it comes to converting DC into AC power whenever you need it. You can rest assured that it is a top quality product because it is by a top manufacturer known in the industry for supplying power inverters to recreational vehicle owners looking for a high quality and durable product. The 81-2010-12 also comes with a battery charger that works to deliver 100amp single output. This power inverter also comes with two pieces of GFCI AC outlets along with two USB ports to power your appliances. These features let you connect four devices at once for your convenience. One more thing I liked about the model is that it is designed with a sturdy plate that works by holding all the components for the connection, ensuring their safety. You won’t also have a hard time using it for the on and off remote switch, which also has a smart feature of an ignition lockout. The power inverter can also promote power sharing to make sure that the input circuit breaker of the AC can prevent tripping. The power sharing function can also let users optimize and change the settings based on their needs. You can also rely on it for the temperature compensation that also works with an equalization stage. What does that mean? It only makes sure that you can charge deep cycle batteries with safety and optimally. 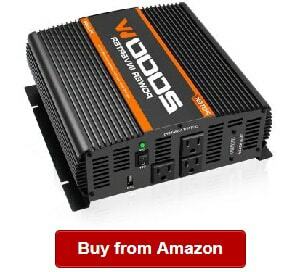 Overall, this product is a top choice for recreational vehicle owners looking for a durable and high performance power inverter for their vehicle. On the downside, this product is quite bulky, though. Adding an inverter to a travel trailer is a breeze when you choose the GIANDEL 2000W Power Inverter. It is from a professional manufacturer and supplier that is known for its dedication to providing top quality inverters to RV owners looking to get the most value out of their investment. It is ideal for use in outdoors, vacations, road trips and emergency kits. 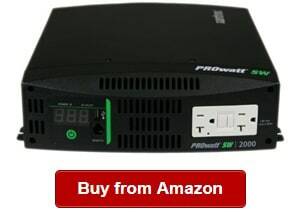 You can rely on it for providing continuous power to your devices and appliances for up to 2000 watts of output power. When it comes to peak power, it can supply up to 4000 watts. You can also count on it for having a USB port and dual AC outlets, allowing you to plug in up to three devices at once. It is also ideal for use in trucks, boats and campers. But aside from it, the unit is also the perfect choice for its soft start technology. This model also has an intuitive and isolated output and input design. It also features total safety protection systems against overloading, over voltage, under voltage, short circuit and overheating. Regarding durability, you can also count on the unit for its aluminum alloy shell, which is able to offer enough protection from bumps and drops. This unit can also prevent overheating of the device for its built-in cooling fan, which can prevent shortages, too. The product also comes with a good 18-month warranty, offering you peace o mind of help’s availability when needed. It is also a sign that the manufacturer is serious about and trusts its products’ quality. You can also charge your devices on the USB charging port included in the design of the inverter. Another thing I would like to note on the unit is its remote control cable length with 4 and half feet in length, making the unit easier to control. It also comes with a clear user manual for ease of installation. On a negative note, this product has a fewer number of outlets than the others featured in today’s reviews. You don’t have to worry about RV inverter problems when you got the durable and heavy-duty power inverter on your RV. This dependable unit is able to provide up to 2000 watts of continuous power. It is not all but it can also offer 40000 watts of surge peak power. 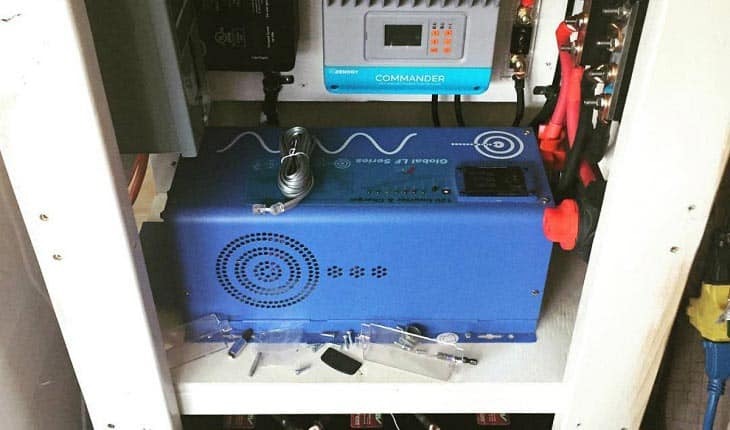 The Pure Sine Wave Inverter can also provide multiple protection systems that include overload protection, over temperature indicator, high input voltage protection for its automatic shutdown and low battery voltage shutdown and warning. 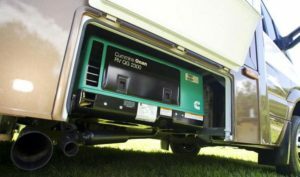 These are some of the most important features to look for when buying an RV power inverter to ensure the safety of your appliances and devices. The power inverter also includes a USB port, letting you charge your electronics without any hassles. It also comes with dual AC receptacles that let you plug in two appliances or devices at once. The design also has the easy to use on/off switch, letting you control it conveniently. I also liked that this product is tested and certified to meet stringent UL458 standards, ensuring that it is a high quality and reliable product to trust when it comes to delivering high performance and safety for use in the recreational vehicle. This model is also ideal for appliances and equipment up to 16.6 amperes. You will also appreciate that it comes with a two-year warranty, which is good to ensure that you’ll have peace of mind in purchasing the product. You can also have an optional on and off remote if you want to. The product can also notify you of overloading for its display, which is clear and easy to use. The display is clear enough to provide you with all the details you need to prevent potential issues. The product also comes with cooling fan that can help in preventing overheating of the device. This unit also includes an internal blade fuse protection, one of its top features that you will appreciate. In addition, I also liked the low voltage alarm and low voltage shutdown, that makes the inverter a smarter choice versus other products in the same category are. Lastly, the device is one of the lightest in the category, weighing only 5.3 lbs. On a drawback, you should buy battery cables separately because they’re not included in this set. Whenever you’re in places where only AC power is available, you need to use a power inverter like the Go Power! GP-3000HD. It is a solid and heavy-duty RV inverter that you can rely on for heavy demands and plenty of applications. It is an ideal product for the camper, truck, travel trailer, boat and recreational vehicle for its versatility and top performance. You will also love the Go Power model for its ability of converting DC power to AC power whenever it is required in the camping site, job site and other remote applications. The unit can run loads reaching up to 3000 watts of continuous AC power to your appliances, including microwaves, refrigerators, blenders and televisions. It is a dependable product to provide enough power to most of your recreational vehicle electronics, appliances and devices. One more thing I appreciate about the inverter is its four pieces of AC outlets, which let plugging in four devices and appliances at once. These outlets also allow hooking up directly to the batteries. When it comes to providing continuous power, you might want to take a look at this product that can be your perfect ally in your RV. You can also depend on it for the easy hooking up to the battery provided you have GP DC kits. This product also offers multiple protection systems, including on overloading, under voltage and over voltage, protecting your RV appliances and devices from damage. It is one of the best features that the product has that makes it a top choice among RV owners looking for a high quality and durable power inverter. On a drawback, this product has a shorter warranty versus other models on the market do. 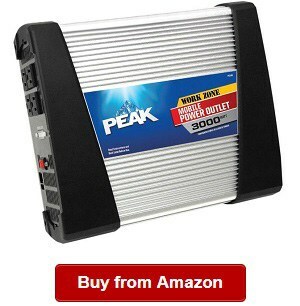 The Peak PKC0AW is another top contender for the best RV inverters because it is reliable and top performing to give you all the power supply you need for your appliances in places where only AC power is available. With minimum effort, you can use the Peak PKC0AW for the maximum power of up to 3000 watts that it can supply your appliances and devices with all the time. This inverter can be used for powering many kinds of tools and equipment, including power tools and chainsaws. You can also use it for a refrigerator and microwave. The Peak PKC0AW is also able to convert the 12V power source into a standard source of power that you can always rely on without any hassles. You can also make use of and connect it directly to the battery of your vehicle. Thanks to its mounting brackets that also make installation quick and easy. When it comes to quality, you can also count on the unit that is ETL certified. It just means that the RV power inverter is tested and rated for its safety. Being certified also means that the product is proven not to damage your devices and vehicle when supplying power to them. This product is also designed with additional safety features, including an alarm and an automatic shutdown protection. It can offer multiple protections including over temperature and overloading. It also means that you can easily learn about the battery status without any hassles. This model also includes connecting cables that you can conveniently use to connect to the battery of your vehicle. In terms of added convenience, you can also rely on the remote on and off switch that also comes with an extended 10 feet cable. In addition, you can also count on the power outlets for their maximum capabilities. However, you might have to connect them directly to the battery of your car or vehicle using the clamp cord included. On a drawback, it is costly, though. You have probably bumped into this unit while reading Xantrex pure sine wave inverter reviews. It is another great power inverter from the brand that has been around for many years, offering its consumers with long-lasting and reliable products that they can make use of and rely on all the time for their recreational vehicle. It is the good power inverter that is able to provide users with an excellent performance of converting DC power to AC power when needed. When you’re in places where the only available power source is an alternating current, you can rely on the unit that works well in offering you with great performance that you can always count on. For one, it is also flexible that it can be used in trailers, campers, recreational vehicles and boats. It is one of the things that make it a great choice when it comes to being useful for many situations. This unit is also ideal for dead battery charging that is one of its nice features to appreciate. The power inverter is also useful even for solar installations. This feature is not in other models or brands on the market. It also adds to the versatility of this product in offering you more functions. I also liked that the unit has configurable settings that make it even easier to use based on your preference. You can rely on the unit that is able to work efficiently without any hassles. In addition, this product is made of durable materials that make it heavy-duty for long-lasting use. Overall, the Xantrex Freedom is a decent choice for users that want to use a heavy-duty and efficient power inverter that is also able to provide full protection to the RV and its appliances and devices. On a drawback, this product is a bit bulky than other models on the market is. When looking around for a 2000-watt pure sine wave inverter, you should not miss the Bear Claw Industries unit that is able to offer up to 2000W of continuous power and up to 4000 watts of peak power output. One of the things I also appreciate about the model is that it has a dual LED display that shows DC and AC voltage. It is clear enough to see even at daytime. You can rely on the inverter model that can provide you with ease of operation for it can show you what you need to see without any hassles. This system is also intelligent for offering different protections for your recreational vehicle. Some of these include overload protection and over temperature protection. Others include over voltage, reverse polarity and short circuit protection. With all these things, you can have peace of mind that your valuable investment, including all your appliances and equipment. The Bear Claw Industries power inverter is also one of the best when it comes to preventing overheating. it has dual automatic fan cooling that is able to disperse heat equally to protect the device from thermal damage. You can also have peace of mind that you can use multiple devices at once on it because it is designed and constructed with quad power outlets. You can also rely on its six-stage automatic smart protection circuit, one of its best features I did not find in other models on the market. With it, you can be certain that your appliances will have protection from damage all the time. On the downside, this product is a bit heavy at 11lbs. Smart RVing is your one-stop source of recreational vehicle guides, tutorials and information. Our reviewers are seasoned and experienced in testing and reviewing different types of RV devices and equipment like a 3000 watt 12v pure sine inverter charger. You should trust us because we’re sincere and passionate about sharing our knowledge with the world and fellow RVers so that they can pick the best appliances, gears, devices, such as the best RV compressors and supplies, such as RV power inverter charger, for their travel trailer, camper, mobile home and recreational vehicle. We also conduct thorough research, comparison and review of the best RV power converters. Our team does hope that you select the right inverter to work for your RV based on the buying guide we have made and the reviews we have done on the top picks in the category. This is a special RV device that is designed and built to convert low voltage DC into the standard AC power. You can find many of these on the market. Later, we’ll point out the types of an RV inverter. For the meantime, let us discuss how useful this device can be once installed on your rig. The RV power inverter aids in operating appliances and equipment on your travel trailer, camper or recreational vehicle with the use of power the renewable energy sources can produce. Some of these include solar panels, wind turbines or your truck, boat or RV’s battery. The inverter works as an excellent backup power system and power source for the appliances onboard your vehicle. It also works by protecting your precious investments in the event of a power failure or outage because it can serve as a backup power for some of your appliances, such as refrigerator. The next question is how does the inverter work? At the very least, it will only start working by drawing some power to your battery. The power that it will consume is DC. The inverter then, as its name implies, will then convert the power to AC power. It works efficiently using this system because the appliances running or operating are using alternating current. But then, there are also large appliances or equipment using alternating current. The same thing will happen. The inverter is going to convert the direct current power into alternating current. In this case, you can run all your RV devices and appliances without any problems. However, you also have to use a converter first to convert 12V DC into AC because you cannot use the electronics by plugging them into the socket of your vehicle directly. It is one of the main functions of the inverter. It is valuable in running appliances by attaching or connecting it to your vehicle, and then your RV devices and appliances to the RV inverter. Before shopping around for a travel trailer inverter, you should be familiar with the different types of inverters out there so that you can make an informed decision that will also give you the best results in using such device. 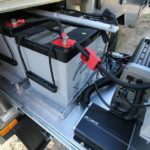 Check out the following for the types of inverters to use in a recreational vehicle, camper or trailer truck. Its principal feature is a waveform. This inverter works excellently with most appliances. A drawback is that it can reduce the efficiency of that equipment. Another problem is that motors will draw more power from this type of inverter because it has a lower efficiency than other types of inverters do. For example, running a refrigerator on a modified sine wave inverter will cause this appliance to work less efficiently than when using other types of inverters for it. You might also hear some buzz from certain appliances running on a modified sine wave inverter. 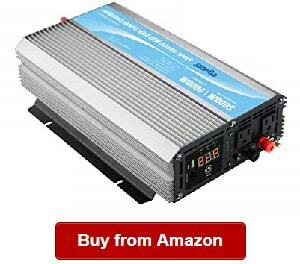 This type is more affordable than a pure sine wave inverter. However, issues like a noisier operation can be an issue with it. Now, if noise is less of a concern, then you might want to go for the modified sine wave inverter. It is one of the most common choices for RV power inverters on the market. Sine wave is generated by rotating air conditioning machinery, for example. it is what you’ll receive from local utility companies, too. In all cases, sine waves are naturally produced through rotation. It is an advantageous type of inverter for any RV owner because it works compatibly for virtually all appliances. By choosing it, you can have peace of mind that your appliances will work efficiently and at their normal functions by running them on a sine wave power inverter. You might want to go for this type when it comes to its flexibility and suitability for most types of appliances sold on the market now. For example, appliances like motored ones will also work optimally and produce their total output if running on a pure sine wave source of power. Other appliances to take advantage of this inverter include battery chargers and bread makers. 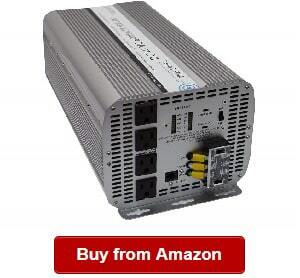 When it comes to anticipated cons, this type is more expensive than other types of power inverters on the market are. 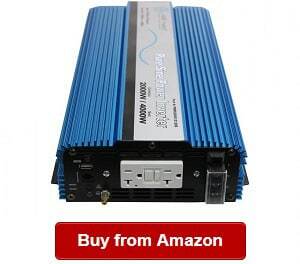 This is another type of power inverter that is known for its very affordable price. You can rely on it for running simple appliances and tools running with universal motors. However, this is least common on the market because of its limited functions and capability. The main purpose of the RV inverter cannot be discounted because it is able to convert 12V DC to 120V AC without any hassles, which is why it is one of the most important devices to have in your recreational vehicle. Most RV owners recognize the value of the inverter for their vehicle. For one, they can make use of it conveniently when they go to places where they have no access to electricity. In this case, they have to use the inverter to convert their battery’s 12V DC into 120V AC to run their appliances. Also by choosing pure sine wave inverter, you can have peace of mind that your electrical appliances and electronics will run at their peak efficiency and function. Another pro of having a power inverter is that it does not require gas or fuel to run or operate. The only thing it does is converting your battery’s power. In this case, you don’t need to operate it with fuel or gas. It is one of the convenience offers of having a power inverter aboard your RV because it does not cause any hassle to operate. With it, you don’t also need to store gasoline onboard with a power inverter with you. In addition, the device operates quietly versus generators that tend to produce noise when running especially cheap ones that do not have quality motors. 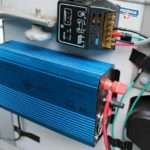 For this reason, it is better to choose a power inverter for many RV owners because they don’t have to deal with the noise that a generator would otherwise generate. So if you have to use power at the RV camping park, you don’t also have to worry about disturbing other people. Definitely, there are many benefits to having an RV power inverter onboard. You should not miss these things especially if you want to keep those appliances onboard running and operating efficiently to provide you with life’s conveniences, such as running a television or refrigerator while camping. Also in places where alternating current is required, you can also count on the power inverter. Aside from the benefits, you must also know how to pick the best inverters so that you can get the best results. Some of the things to look for include the following. You should also consider as an important factor when choosing a power inverter to find the perfect match for your RV. You must go for one that is compatible with the voltage of the battery that is supplying the inverter with the power it needs to convert DC to AC. You should also check the power rating of the inverter that you will buy because they are of varying size between 50 and 50,000 watts. In addition, you should know the maximum surge, letting you know of the amount of time the device can maintain a particular surge. Most often, the rating is noted at a specific number of watts for a few seconds. You should be mindful of considering this factor when selecting the inverter size for your rig because you have to ensure it meets two important things, typical power and peak power requirement. The typical power is that the power that the device requires to supply continuous power at a given watt rating. On the other hand, you also have to consider the surge, which is the max power amount that the device can provide the appliances with for a maximum of 15 minutes in some cases especially among electric motors requiring a higher startup surge. It is another significant factor when deciding which inverter to select. For example, the one to choose should not draw much power or increase consumption, but then, it also means that it should not lead to power and energy loss. Q: What are good RV inverter brands? A: There are many good inverter brands on the market. We’re happy to say that we have included the best of them in the reviews above. A few of them include the Ampeak, AIMS Power, Power TechON, VertaMax, POTEK, Xantrex, Power Bright, KRIËGER, GIANDEL, Go Power, Peak and Bear Claw Industries. You can start making a comparison and doing your homework to select which among them will meet your needs. Q: What is the difference between modified and pure sine wave inverter? A: There is a big difference between the pure sine wave and modified wave inverter. Please do refer to the types of power inverters we have written earlier about their main differences. At the very least, the pure sine wave offers far more benefits than the other does. Q: Is 12v appliances better than 110v with inverter? A: We have found an answer to this question from this source. If you have an inverter, you won’t need 12V appliances because they are more expensive. For kindle, notebook computers or cell phones, you can use 12V chargers. Now if you’re planning running off the inverter while camping or dry camping without power source, you should add a power source to your battery capacity, and then use generator or solar or both to charge appliances. On the other hand, the same source revealed that you could use the device with 120V appliances without the battery because the alternator can supply needed power. Another source revealed that 12V devices are drawing less power, as they’re smaller and designed for a boat or RV with less power. Now if you can use a 12V device, it might be more efficient than using an inverter that can be 80 percent in efficiency based on the model. For example, a 12V 100W lamp is going to use less power than an 110V 100W lamp on an inverter. Q: What size RV inverter do I need? A: It depends on your intended purpose of using it. For example, avoid going for a larger unit if that is what is not you need nor a too small one that cannot meet your requirements. In addition, you should assess the output capacity of the model you’re looking into so that you can operate the loads that you put into it. Nevertheless, you might want to begin with the selection process using our top picks here. Q: How to install RV inverter? A: You can easily do it alone because many of them come with a user manual that you can follow to install your inverter. So in all cases, you should be able to read and follow the guidelines closely to set up the power inverter in a breeze. Q: How to use RV inverter? A: Most models can be plugged directly to the vehicle’s battery using a DC port to find on the dash. You can also make use of the cables supplied in the model you have chosen by attaching them with your car’s battery. However, you must check their compatibility before plugging the inverter into your lighter. You should also ensure that enough ventilation is available before operating the inverter. 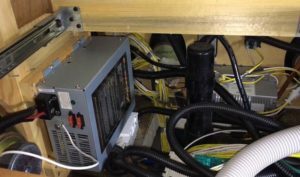 Q: How to tell if RV inverter is working/ bad? A: You can tell that the inverter, such as the Aims power picoglf30w12v120vr, is working if it is functioning as it is intended to be. On the other hand, a bad inverter will stop working correctly, leading to a power outage, breakdown or failure of the unit. There you have our guide on the best RV inverter on the market right now! We do hope that you could pick the right one that matches your needs. So again, make sure that you compare your options by looking into some of the most important considerations when buying this RV inverter based on those we have mentioned earlier. 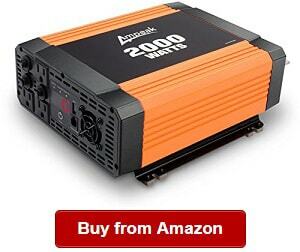 Finally, select from one of the top-rated power inverters today! If you’re looking for other products in RV power and electrical supplies, then we suggest going for these articles: best RV generators, best RV converters, best RV surge protectors, best RV solar panels and best RV batteries. We do hope you find them useful. Thanks! Thanks for the 16 reviews but ,why is Amazon the recommeded seller? Thanks, John. Amazon is safe and reliable. Do you think so?